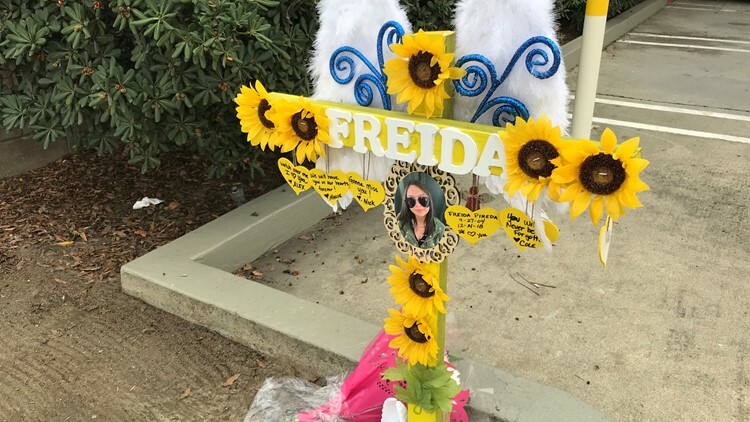 Blue ribbons and sunflowers now hang in front of Dutcher Middle School in honor of one of its students who family and friends have identified as a "Frieda." TURLOCK, Calif. — A Turlock community is reeling after a teenager was killed Friday night when the car she was riding in was hit by an alleged drunk driver. Two other teenage girls, who family friends identify as her cousins, are still in the hospital after the crash. The crash happened near Monte Vista Avenue and Geer Road. Friends say the teens were struck in their sedan by a suspected drunk driver in truck as they were pulling out of a gas station parking lot. 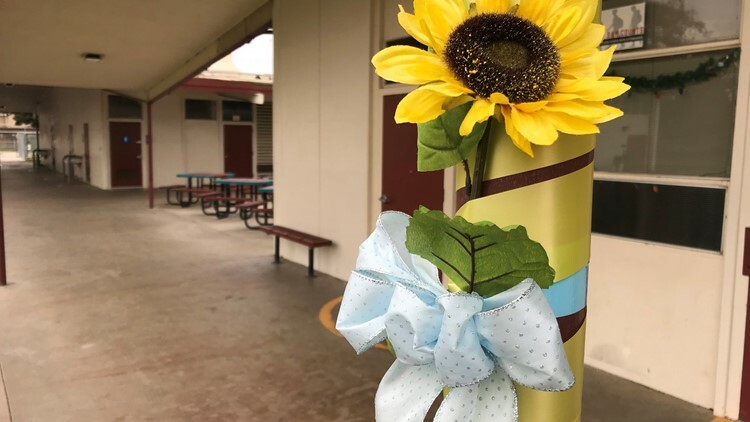 Blue ribbons and sunflowers now hang in front of Dutcher Middle School in honor of one of its students who family and friends have identified as a "Frieda. "Family friends say the young girls mother was out of the country at the time of the crash, so officials have not yet confirmed her identity. Light blue ribbons were hung because light blue was the young teens favorite color. The Turlock Unified School District addressed the young girl's death in a statement to Dutcher MIddle School families. Bettencourt said her niece went to school with the girl killed in the crash, and that she can only imagine how difficult it is to talk to young teens about the crash. “To have to tell 13- and 14-year-olds that their friend was killed and how," Bettencourt said. "And it’s just so devastating that they were just doing Friday evening things, out to dinner or running errands or just our everyday normal things that we take for granted." Bettencourt said the young girl was "a bright shining star. She’s just very sweet, very open, very personable, always smiling." A cross now marks the site of the crash with handwritten notes from classmates, sunflowers and angel wings. A cross was put up at the site of crash that took the life of this young teenager from Turlock. Police say the driver of the other vehicle, 21-year-old Kevin Solis Hernandez, was found on scene with minor injuries after crashing his truck into a nearby carport. Hernandez was arrested on scene for vehicular manslaughter and DUI causing death or serious bodily injury. Continue the conversation with Lena Howland on Facebook.